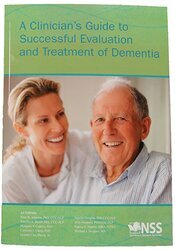 This book was written for SLPs, OTs, PTs, and Psych Therapists because of considerable uncertainty "out in the field" regarding how to evaluate and treat persons with dementia. Therapeutic techniques selected often do not take the person's diagnosis and staging into mind. Subsequently, this can lead to pessimism regarding the efficacy of doing therapy with persons with dementia. Jerry Hoepner, PhD, CCC-SLP, is an associate professor in the Communication Sciences and Disorders department at the University of Wisconsin – Eau Claire. He has 15 years of clinical experience and more than 10 years of teaching experience in the areas of acquired cognitive disorders, dysphagia, neurological aspects of communication, aphasia and related disorders, anatomy and physiology, research and speech and hearing science. Dr. Hoepner’s research interests include self-assessment, video self-modeling, and coaching everyday partners of individuals with traumatic brain injuries and aphasia. He also researches teaching pedagogies and self-assessment in university students. Dr. Hoepner’s clinical interests include utilizing everyday routines to reduce demands on working memory and optimize executive functions. He is actively involved in community-based brain injury, aphasia groups and aphasia camp. In addition, Dr. Hoepner acts as a clinical supervisor and is active in student-faculty collaborative research projects. He received his bachelor’s degree from Minnesota State University – Mankato in psychology and his master’s degree from University of Wisconsin – Eau Claire in communicative disorders. Dr. Hoepner completed his doctorate in communicative sciences and disorders at UW Madison with an emphasis in neurosciences and traumatic brain injury rehabilitation. Peter R. Johnson, PhD, CCC-SLP, earned his MS and PhD in Speech-Language Pathology at the University of Pittsburgh and an Executive Graduate Degree in Healthcare Financial Management from Ohio State University. As a healthcare consultant, Dr. Johnson develops continuing education programs, coaches one-on-one mentoring, and assists in the development of memory units. His previous experience includes working in acute care, home care, outpatient clinics and long-term care. Dr. Johnson served as a Column Editor for the American Speech-Language Hearing Association (SID 13) Dysphagia Newsletter and the (SID 11) Administration and Supervision Newsletter. He is a four-time recipient of the President’s Award and the Outstanding Service Award from the Florida Association of Speech-Language Pathologists and Audiologists. He is the Chair of the Florida Department of Health State Licensing Board for Speech-Language Pathologists and Audiologists. Dr. Johnson has co-authored several books including Business Matters: A Guide for the Speech-Language Pathologist, Drugs and Dysphagia: How Medications Can Affect Eating and Swallowing and Practical Pharmacology in Rehabilitation: Effect of Medication on Therapy and the newest book, A Clinician’s Guide to the Successful Evaluation and Treatment of Dementia, published in 2016.